Tell Congress: Don’t fund Trump’s border wall! There is a crisis at the border. And despite what Trump is telling the U.S. public, the crisis is NOT families seeking asylum. The crisis is Trump’s hate-fueled policies and efforts to turn the southern border into a war zone. The freedom to seek asylum and safety is a human right. And if you think the situation couldn’t get any more dire than it has — it just might. Because this week, Congress will be fighting on whether to fund Trump’s hateful multi-billion dollar U.S.-Mexico border wall, facing possible shutdown. 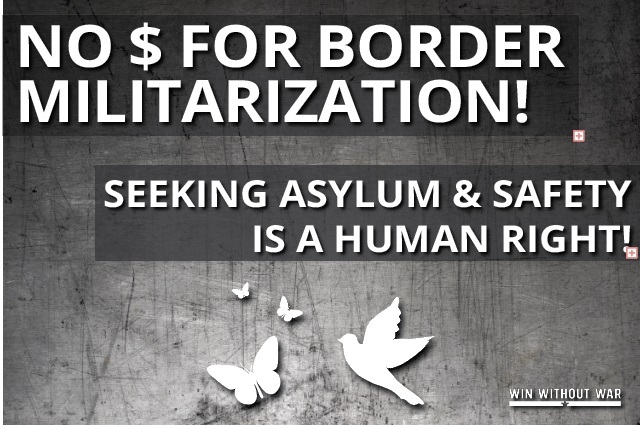 Sign now and tell Congress to stand against border militarization and not fund the U.S.-Mexico border wall! Please don’t fund Trump’s border wall. People have the right to seek asylum at the border, and instead are facing active-duty troops, walls, detention centers and tear gas. You cannot pour more money into militarization. This is not the solution.